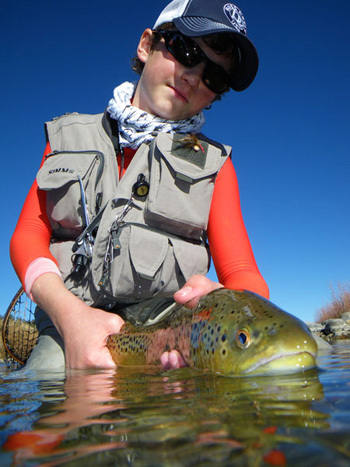 ALTHOUGH HE IS only 12 years old, Tyler Befus keeps amazing fly anglers from all around the world, whether they are just kids or adults with decades of experience. Young Tyler has every right to say that fly fishing is his life. Instead of crying in his crib, he watched and stalked fish from a backpack with his father Brad Befus, who is sales manager of Ross Reels/3M Sports and Leisure. As of today, Tyler has caught more than 30 species of fish with fly tackle, published many articles, and written two books. He is a also on the pro staff of such popular brands as Rio, Simms, Whiting Farms and Umpqua Feather Merchants. Tyler, I’m not sure if there’s an actual world record when it comes to youngest fly fishing companion but if there is, you are certainly competitive. Your father carried you in a backpack carrier, right? How old were you then and how old are you now? I did start fishing out of a baby backpack carrier. I was only about 14-15 months old, but now I am 12 years old. And how old were you when you actually started to fly fish by yourself? Do you remember those first contacts with fly rod and fish? I started fly fishing independently when I was almost three. My most memorable moment at that age was the day before my third birthday. I cast, hooked, fought, landed and released a beautiful brown trout and went on to catch a couple more fish. You know, kids are often preoccupied with other things and there you go blasting the waters and thinking about the next fly you’re going to tie. While growing up, did you get to do the normal things with your peers? Well, I have been able to do a ton of fly fishing and fly tying but we do a lot of other things too. We often make weekly trips to the local fly shops. We go to outdoor and fly fishing shows when ever we can. I actually started tying at some of the shows when I was just three years old. My very first public tying demonstration was at the Western Colorado Fly Fishing Expo, where I tied Woolly Buggers. Now that I am getting older I am able to do more in the sport of fly fishing and hopefully making a bigger impact in people’s lives. I have many activities besides fly fishing that I like to do as well. I have been swimming competitively since I was six years old on the Montrose Marlins swim team. I also play other sports like soccer, hockey and baseball, but swimming is my favorite. I also play piano, draw with colored pencils, paint with watercolors, and love photography. Besides fishing and tying flies, you are avid about getting more kids and young people to sport. Can you tell us something more about that? 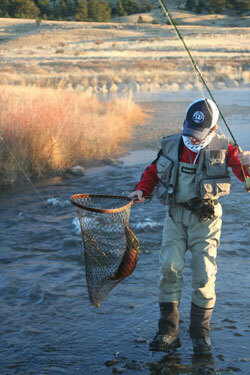 Youth are the future of everything including fly fishing. I want fly fishing to be there for many generations to come. If there in not a future (kids) for fly fishing it will be a huge loss for people of all ages. That is what makes me so excited to get more kids and beginners into the sport, and that is also what drives me to what I do. You’ve written numerous articles and even two books. Can you tell us in a few sentences what are the books about and how you came up with the ideas in the first place? When I was in first grade I wrote simple little books about fishing and drew funny fish pictures in them. They were fun to make. When I was seven I told my dad that I wanted to write a real book about fly fishing for kids. We presented the idea to a publisher, they liked it and gave me a deadline to write the book. My first book, A Kid’s Guide to Flyfishing: It’s More than Catching Fish , is about the adventures of fly fishing. 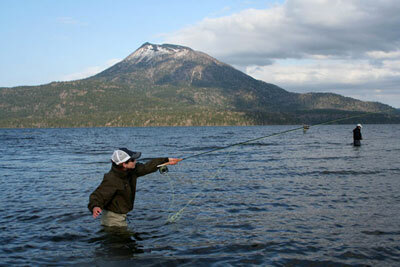 It covers the basic skills of fly fishing. With my second book, A Kid’s Guide to Fly Tying , the process was the same as the first, but when I wrote it there was a lot of pictures that had to be taken for the step-by-step fly tying tutorials. This books covers the basic fly tying skills and shows some effective patterns. I also just completed my first DVD, “A Kid’s Guide to Fly Fishing.” It covers gear, casting, knots, fly tying, how to locate the fish and some basic fishing techniques. What is your favorite style of fly fishing? What are you favorite species of fish? What about your favorite tackle set? I love sight-fishing! It is so much fun to find the fish and then have to make the perfect presentation to fool them. Sight-fishing for the small trout and char in the crystal clear rivers and streams in Japan with dry flies is amazing. I also love streamer fishing in rivers and lakes because you can often see the fish take the fly or explode on it. I like all fly fishing techniques, and it is important to keep learning new techniques all the time to become the best angler you can be. My favorite fish species to fly-fish for are Japanese Yamame trout because they are such a challenge. When you catch one you feel really good because they can be so selective. I also think it’s important to have a general knowledge about fishing for many different fish species because you never know when an opportunity will come up. I am going on my first bonefish trip in July and they sound like incredible fish. They might become my favorite fish after that trip. I will let you know! For fishing in the Gunnison River, my home river, my favorite tackle set up is a 9-foot 5-weight Ross Essence FW fly rod with a Ross Vexsis #2 reel, loaded with a weight-forward fly line. You may be young but you’ve been around — what is your most memorable trip? Best fishing so far? Going to Alaska to catch pike and sheefish was so much fun, and I caught an IGFA Junior World Record sheefish. Both my trips to Japan were great, but my second trip to Japan (May 2009) was the best ever! I landed my largest Yamame trout (almost 11 inches) and a monster 83-cm Japanese Sea bass (Suzuki). I also fished for white spotted char in Lake Akan on the northern island of Hokkaido. And what are your “fishy” plans for this year? Some good trips coming up? I have a lot of “fishy” plans on my schedule for 2011. I will be going to Texas in February to do some fly fishing programs and will fish the Guadalupe River for trout and hopefully get to the coast for redfish. In March I will be in Northern California to speak at a fly fishing club and plan on a couple of days fishing on some rivers in the area. I am also planning on fishing in the US National Youth Championships in Pennsylvania in June and the America Cup Fly Fishing Competition in September. As far as other trips, I am planning on a few days of steelhead fishing with my friend Jeff Hickman in Oregon at some point this year and will be fishing for redfish when I go to the International Fly Tackle Dealer Show this August in New Orleans. I know for sure that I will get a lot of days on the water here in Colorado. I hope to have a total of six books published and a couple more DVDs by the time I am in college. I am thinking that I want to be an architect when I get older. No matter what I am doing I know fly fishing and fly tying will be part of life. You are a kid but you have some great experience so even the older crowd can learn from you. Regarding to fly fishing, what is the best advice would you could share with people who are older than you? Your age does not matter. You can have fun fly fishing anywhere at anytime regardless of your age. The main thing is to have fun. And what would be your advice for the kids? Why go fly fishing? What is so special about fly fishing? Fly fishing is lots of fun and is a great way to experience nature with your family and friends. You can learn so much from fly fishing and can have a great time catching fish while doing it. Fly fishing has so many wonderful aspects to challenge you and make you think. Tying your own flies makes fly fishing even more special because you can catch a fish on something you created and made. Let’s go fly fishing!